NET Mexico Pipeline is a 120-mile, 42" and 48" diameter natural gas pipeline with approximately 114,000 HP of compression. 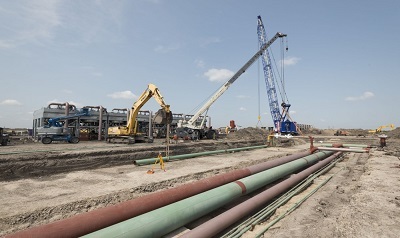 NET Mexico transports natural gas from nine interconnects at the Agua Dulce Hub to the Texas / Mexico border near Rio Grande City, Texas . NET Mexico's Agua Dulce Header will include initially approximately 4.1 Bcf/d of receipt capacity from nine interconnecting pipelines and two processing plants. The header includes separate low-pressure, high-pressure and redelivery lines to provide receipt and re-delivery optionality to shippers.